Grilled Venison Tenderloin Medallions: Buck and Bacon! 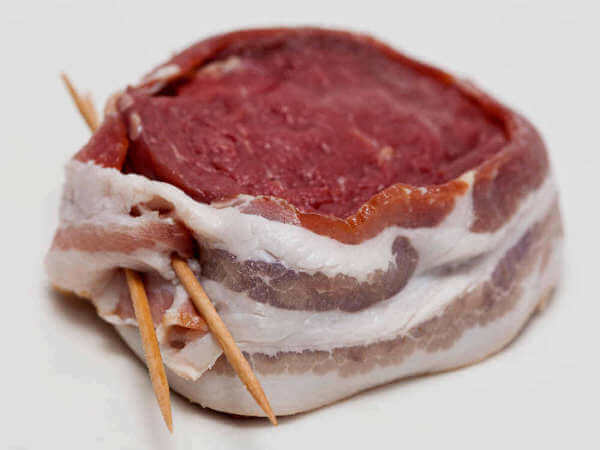 Wrapped with a bit of bacon and cooked over high heat, grilled venison tenderloin medallions are succulent and flavorful. I prefer them cooked to medium rare for the ultimate in texture and moistness. Venison tenderloins should not be confused with the deer's backstraps, or loins, which lay on top of the deer's back. The tenderloins are two long, narrow muscles that are on either side of the underside of the backbone. Since these muscles work very little, they are really tender. You'll get the best flavor grilling these over the hot coals from a wood fire. I start a small amount of charcoal in my Weber, then build a small fire of oak wood on top. When the wood has burned down to hot coals, I commence grilling my tenderloin. Cut the tenderloins into sections, as thick as the bacon is wide, about one and one-half inches. Cut the bacon in half, and wrap a half slice around each medallion. Use a toothpick to hold it in place. Combine the remaining ingredients, and use as a marinade for the venison medallions. Marinate them for one to two hours. When the coals are hot, place the venison bacon side down on the grill. Cook for two to three minutes, then turn once. The bacon should be slightly crispy, and the internal temperature of the tenderloin should measure 125-135 degrees Fahrenheit. If it's below that, move the grilled venison tenderloin medallions to a cooler part of the grill and finish over indirect heat.